This page provides detailed information on the definition of latency measurements in Motive and the NatNet SDK streaming protocol. The OptiTrack systems combine state of art technologies to provide swift processing of captured frame data in order to accomplish 3D tracking in real-time. However, minimal processing latencies are inevitably introduced throughout processing pipelines. For timing-sensitive applications, these latency metrics can be monitored from the Status Panel of Motive or in the NatNet streaming protocol. 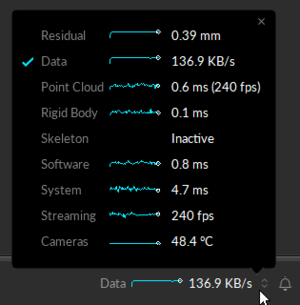 We have greatly improved the latency measurements in Motive 2.0. Now, latency metrics report the time passed since specific points within the processing pipeline. More information is covered in this page. C This is when tracking data is fully solved in Motive. D This is when the tracking data is all processed and ready to be streamed out. E This is when the Client application receives the streamed tracking data. This measurement is reported in the Status Panel in Motive. (Available for Ethernet camera systems only) This value represents current system latency. This is reported under the Status Panel, and it represents the total time taken from when the cameras expose and when the data is fully solved. It represents the amount of time it takes Motive to process each frame of captured data. This includes the time taken for reconstructing the 2D data into 3D data, labeling and modeling the trackable assets, displaying in the viewport, and other processes configured in Motive. Please note that this does not include the time it takes for Motive to convert the solved data into the NatNet streaming protocol format. This conversion accounts for a slight additional latency (≈ 0.2 ms) which is only reflected in the software latency value reported via NatNet, therefore resulting in a small delta between the software latency values as reported by Motive and NatNet. Latencies from the point cloud reconstruction engine, rigid body solver, and skeleton solver are reported individually on the Status Panel in Motive. Exemplary latency calculations are demonstrated in the SampleClient project and the WinFormSample project. Please refer to these sources to find more about how these latency values are derived. Timestamp of Point A: sFrameOfMocapData::CameraMidExposureTimestamp. Available for Ethernet cameras only (Prime / Slim13E). Timestamp of Point B: sFrameOfMocapData::CameraDataReceivedTimestamp. Timestamp of Point D: sFrameOfMocapData::TransmitTimestamp. These timestamps are reported in “ticks” that are provided by the host computer clock. When computing latencies, you need to divide the timestamp values by the clock frequency in order to obtain the time values in seconds. The clock frequency is included in the server description packet: sServerDescriptionPacket::HighResClockFrequency. To calculate the time that has elapsed since a specific timestamp, you can simply call the NatNetClient::SecondsSinceHostTimestamp method, passing the desired timestamp as its input. Using clock synchronization between the client and server, this will return the time in seconds since the corresponding timestamp. This is the latency introduced by both hardware and software component of the system. This represents the time difference between when the cameras expose and when the capture data is all processed and prepared to be streamed out. System Latency may not always be available for all system configurations. Thus, it is suggested to enclose this calculation within a conditional statement. This value needs be derived from the NatNet streaming protocol. This latency value represents the time it takes Motive to process the captured data and have it fully ready to be streamed out. This measurement also covers the data packaging time. In the older versions of NatNet, the software latency was roughly estimated and reported as fLatency data, which is now deprecated. The derived software latency described in this can be used to replace the fLatency values. This value must be derived from the NatNet streaming protocol. The transmission latency represents the time difference between when Motive streams out the packaged tracking data and when the data reaches the client application(s) through a selected network. This value can be obtained by calling the SecondsSinceHostTimestampmethod using sFrameOfMocapData::TransmitTimestamp as the input. The client latency is the time difference between when the cameras expose and when the NatNet client applications receive the processed data. This is basically the total time it takes for a client application(s) to receive the tracking data from a mocap system. This value can be obtained by calling the SecondsSinceHostTimestamp method using sFrameOfMocapData::CameraMidExposureTimestamp as the input. 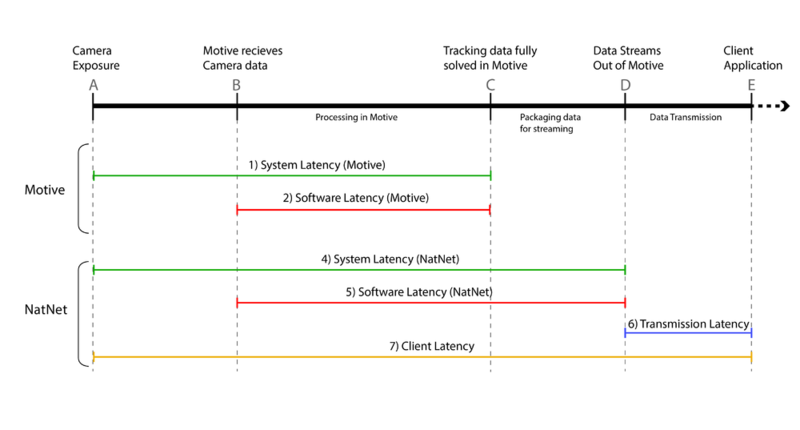 In previous versions of Motive (prior to 2.0), the only reported latency metric was the software latency. This was an estimation of the software latency derived from the sum of the processing times taken from each of the individual solvers in Motive. The latency calculation in Motive 2.0 is a more accurate representation and will be slightly larger by comparison than the latency reported in the older versions. A: When playing media files using applications such as Chrome or VLC, you may experience increased system latency in Motive. This is due to Window's Multimedia Class Scheduler Service (MMCSS). The MMCSS will prioritize CPU resources to these time-sensitive media applications over other applications including Motive. This may cause increased system latency and dropped frames in Motive. We recommend closing media applications if there are any issues with system latency and dropped frames. This page was last modified on 1 August 2018, at 12:57.